Wonderful experience. Nice, clean and simple . Dog friendly . Prefect location. I guess in general all was average but the bathroom towels just drops any good comment I had. Old worn out towels that almost scratch while trying to dry myself after the shower. Overall it's good. Much better than other Motel 6. Excellent placed to be close to Arches National Park. Need more friendly front staff. good convenient location easy access. No more comment. It is a nice motel with newly renovated room. Friendly staff. Good location for entrance to Arches NP Canyonlands NP and Dead Horse Point SP. Moab has many souvineer shops close by. poor wi-fi connection, laundry was out of order. Close to Arches NP and Canyonlands NP. Basic amenities, clean hotel and staff was courteous and helpful. Nice hotel, clean , good location, good price. But it is no microwave, no frige, and coffee maker. Close to Arch national park. Our stay here was good. Basic stay, nothing fancy. We did see a roach during our stay, just 1 though. But, over all hotel and room itself was clean. I wish there was a refridgerator. This is a desert and we had no way to keep things cold. And there is no breakfast at the motel. Not even coffee. Our room looked exactly like the pictures shown. When we checked in, the woman checking in next to us left to go to her room. As we were leaving the reception, the woman with her family and luggages were back saying there were people checked in in her room lol. I prayed it wont happen to us. Room is basic, no fridge/microwave/toiletries. You can ask for hairdryer. And we paid 170/night for memorial day weekend. Pricy! While clean, the room was severely lacking in amenities. I can understand economizing, but providing just two bars of cheap soap and no shampoo, lotion, or conditioner is taking a bit too far. There was no complimentary breakfast and the cherry on the cake was the cockroach in the room. Overall, for the exorbitant price I paid, I was extremely disappointed with the amenities provided. It was nice to have a hotel which allows dogs and it was pretty clean, but all of the lights in the room were super bright LED, and the shades around them were very light(almost clear glass) so I couldn't have any lights on in the room without feeling uncomfortable about it being so bright. Not even one. Spent the evening with the bathroom light on and the door mostly close to let a little bit of light into the main hotel room. They need to fix the lighting situation, otherwise the room was basic but nice. Definitely not worth the $200 cost though. 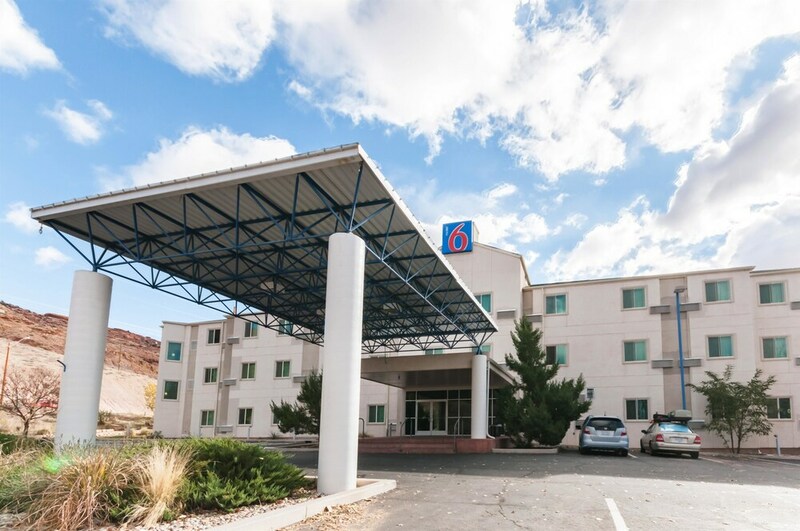 Motel 6 Moab is located within a mile (2 km) of Grand County Civic Center and Swanny City Park. This 66-room motel welcomes guests with conveniences like free in-room WiFi, free self parking, and a spa tub. A flat-screen TV comes with cable channels, and guests can stay connected with free WiFi. Guests of Motel 6 Moab enjoy a spa tub, free WiFi in public areas, and a seasonal outdoor pool. You can take advantage of free parking if you drive. The 24-hour front desk has staff always at the ready. Additional amenities include coffee/tea in a common area, laundry facilities, and a vending machine. Hi Kristin, Thank you for sharing your review. We are glad you enjoyed your stay! Until the next time, We’ll Leave the Light on For You!